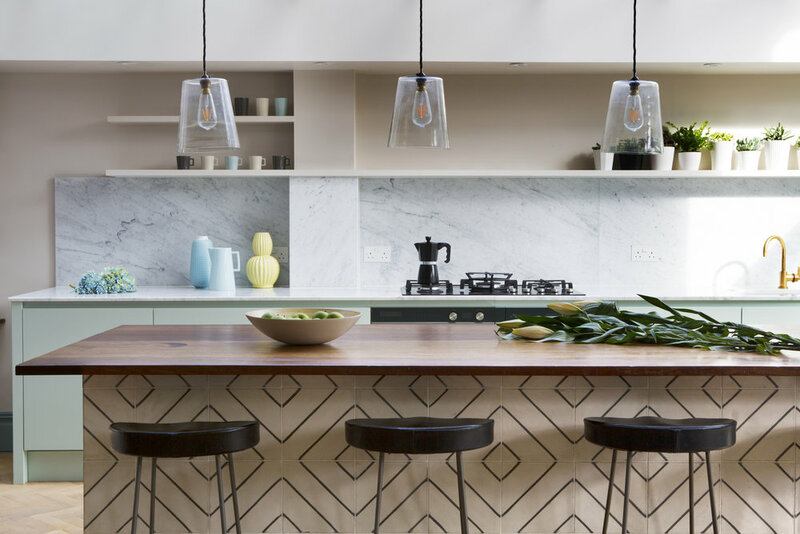 This lovely kitchen was a delicate balancing act, finding the right materials and style to work with the marble worktop, unlacquered brass tap, and handmade encaustic cement tiles that our clients had already set their hearts on. We were able to source a really special piece of iroko for the island - an old chemistry lab worktop, which, after some careful repairs, paired beautifully with the tiles. Our clients wanted everything to be low level, so we put an integrated drawer fridge in the island, as well as another integrated fridge and a freezer. A larder in a side room meant there was plenty of storage space despite there being no tall units. All the other cabinets were full height drawers, and the mitred door fronts were hand painted to keep a soft, textured feel to the kitchen design. In the adjacent snug we contrasted high gloss spray painted doors with otheingle piece of reclaimed iroko, complete with ancient school graffiti!